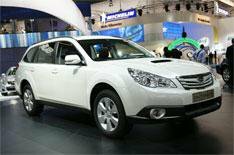 Frankfurt 2009: Subaru | What Car? Subaru is putting a lot of emphasis on passenger comfort and space with its all-new Legacy. In fact, the company says the car, which goes on sale in October from about 19,000, provides new standards of passenger comfort. An 80mm longer wheelbase than the current car should help, but an electronic parking brake, larger door openings and more sculpted seats are all aimed at freeing up space for those on board. Youll be able to buy saloon or Sports Tourer estate versions, or theres the more rugged Outback estate version, which has extra body cladding and raised ground clearance. The engines are 2.0-, 2.5- or 3.6-litre petrols, or an updated version of the companys 2.0-litre diesel. This has horizontally opposed pistons, which push out from the crank, like two boxers standing back to back. A new continuously variable transmission will also be available, which will help to cut fuel consumption and emissions. As youd expect, all versions will have four-wheel drive as standard. Theres something on Subarus Frankfurt stand that it has needed for a long time a diesel version of the Impreza. Subaru's 2.0-litre 'boxer' diesel engine has previously been available in only its Legacy, Outback and Forester models, leaving the Impreza nothing to match diesel-powered rivals such as the VW Golf and Ford Focus. Until now, that is. The new Impreza 2.0D comes with a six-speed manual gearbox as standard and manages average economy of 47.9mpg and CO2 emissions of 155g/km. That's not a patch on figures of the best small family hatchbacks, but it's a big improvement on petrol-powered Imprezas, which can muster only 37.7mpg and CO2 emissions of 176g/km at best. The Impreza 2.0D models are on sale now, at 20,000 for the RC and 22,225 for the RX.